Graphic Novel Review 91/365: Down. Set. Fight! Thing the first: while purchasing ingredients for chili yesterday, I was at the register, and a guy asked, “Chili for the game?” I said, “Games…” He smiled, clueless that I meant board games. I don’t really get that into sports…baseball, maybe…and a little basketball, but that’s about it. I think he meant the Bears game, Cubs? I don’t know. D&D is my fantasy football. This brings me to thing the second: the kids in my graphic novel class ask for more sports titles, which is not my wheel house (see thing the first). So, when I come across a sports book that I dig, I get excited! About two years ago at C2E2, I was walking the floor with a few friends, and we were at a booth with great deals. I believe it was either fellow Comic Book Teacher Adan Alvarado or Adam Ebert that picked up Down. Set. Fight! and handed it to me. 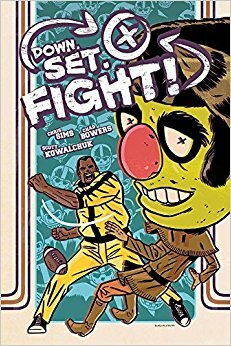 He told me it was sort of Scott Pilgrim-ish, if Scott Pilgrim was an ex-football player fighting team mascots instead of evil exes. Uhhh…I bought it forthwith. It’s been on my classroom shelf ever since. Down. Set. Fight! 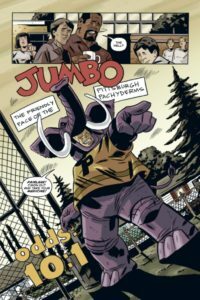 is the story of fictional football legend “Fearless” Chuck Fairlane and his battle with team mascots. Punches, kicks, getting hit with chairs: this book has all of the cartoon-y violence that you can ask for with one of the combatants usually wearing a crazy large mascot suit. This image is a good representation of the art: lots of clean lines, shadows, and solid colors, Down. Set. Fight! is all kinds of fun. Fairly simple panel/page layouts means that this could be a good entry graphic novel for new to the medium readers. I don’t want to spoil much about the plot because it’s crazy! BUT I will tease that the book dabbles in conspiracy and F.B.I. inclusion. Nothing is as it seems, except the beating of mascot butts!